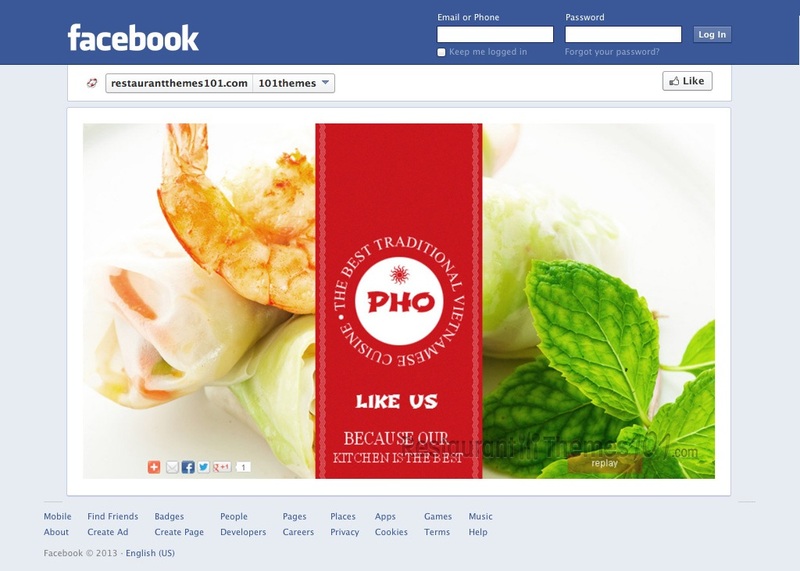 PHO is a very interesting Facebook restaurant page template created by Lynx. It looks very unique and compact, and this template is featured at Template Monster. If you want your Facebook page to look amazing and grant you many new fans and visitors you should consider this template, you won’t be sorry! This template was created so it grabs the attention of everyone the minute they enter your page. A pretty Flash animation starts up immediately, showing the most important features of your restaurant right away, making sure all the right things are highlighted. Once they open your page, a big slider starts rolling, showing great, quality photos of your delicious food, and captivating everyone’s attention, focusing it on your delicacies. You will be able to write a nice note to make your visitors feel welcomed at you restaurant, or a cute, catchy phrase that will stay in their minds for a long time. Choose your words carefully, because this is how you are representing your place. This note will appear in a cute box, and it will be followed by the appearance of another box that looks just as cute, with an option of adding a photo of your most popular meal. You will be able to write a short description of the meal as well. These boxes look like opened books (or notebooks maybe? ), and you can fill those “pages” with anything you like, no matter if it’s photos or you simply want to write nice introduction texts for your guests. Let your imagination run wild, and present your restaurant exactly the way you want to. This template features many social network buttons. This way, you will not be popular only on Facebook, you will also be able to easily connect all of your other social network accounts to this one, and have endless sharing possibilities. PHO is a very interesting, unique and out of the box looking template. It will surely get you a lot of new fans and a great deal of publicity.